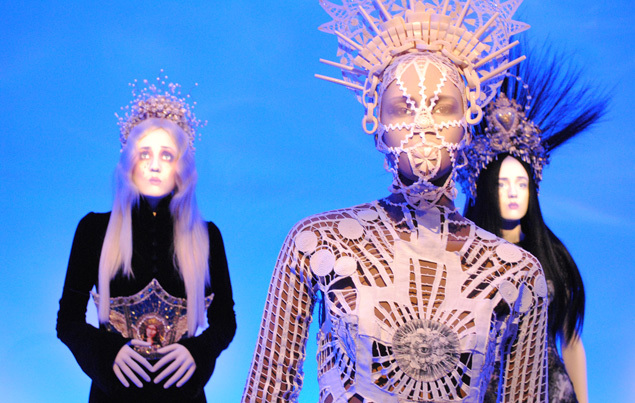 If the fashion doesn't capture you, the animated mannequins will. 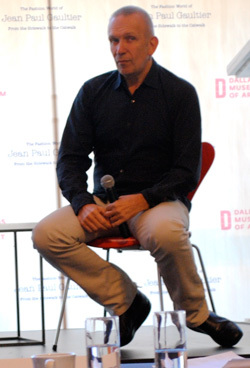 As I type, Jean Paul Gaultier is across the street at the Dallas Museum of Art chatting with the press about his exhibit, The Fashion World of Jean Paul Gaultier: From the Sidewalk to the Catwalk, which opens to the public on Sunday, November 13. You may have seen pictures leaked from yesterday’s welcoming events, which included a lunch and evening reception. Enjoy the photos, but don’t let them satiate your appetite. I’ve had the privilege of walking through the galleries of gowns last night and this morning and I’m blown away. You’ll likely never be invited to his couture shows in Paris, and I’m guessing you’re not ready to hire him to make you a bespoke dress anytime soon. 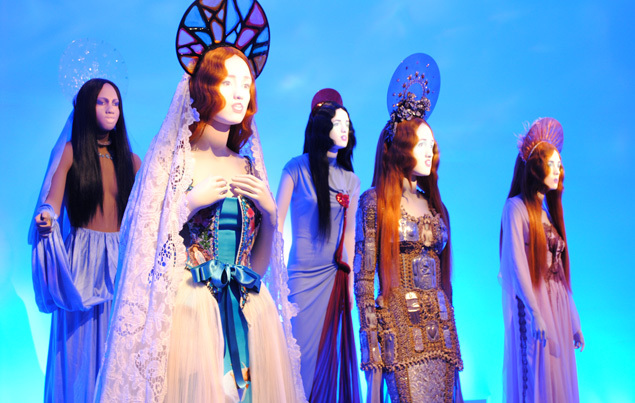 But you can see this collection of about 130 exquisite couture ensembles from over the years, all under one roof, glittering wildly on animated mannequins. We are only one of two cities on the map (and the first–take that, San Fran) for this U.S. tour. This is truly an opportunity not to be missed. 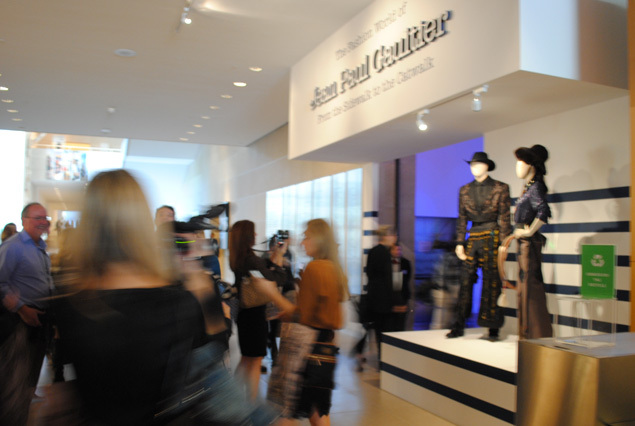 Follow the jump for photos from the exhibit, a bit of Jean Paul Gaultier history, and a word on his collection of garments, which he says are not art. I’m a fan of the underwear-as-everyday-clothing look. Corsets and sheer lace are too beautiful to stay hidden. 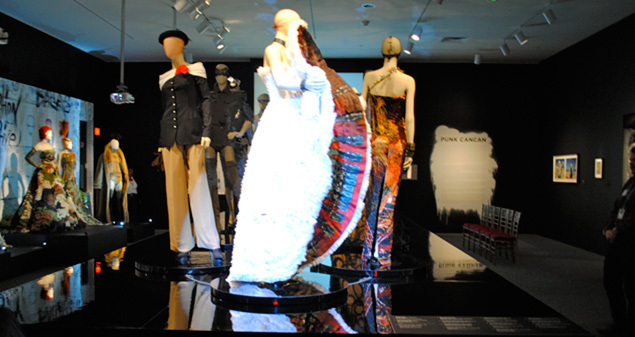 Jean Paul Gaultier often leads the revolving trend, debuting his corset-style dresses in 1983, designing Madonna’s Blond Ambition World Tour costumes in 1990 (cone bra, ring a bell? ), and since then designing hundreds of corset-inspired pieces, including evening gowns, crocodile and leather wear, and my favorite, a black stone skeleton piece worn by his sometimes muse, Dita von Teese, who appeared on his arm at last night’s event. 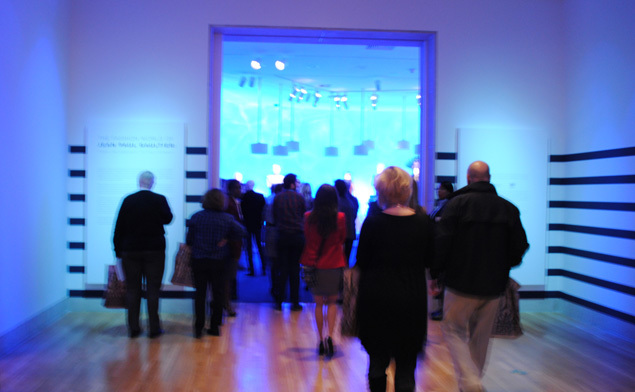 The exhibit features six themed rooms: The Odyssey of Jean Paul Gaultier, Boudoir, Skin Deep, Punk Cancan, Urban Jungle, and Metropolis. You’ll see his famed underthings-turned-outwear grace every room. The inspiration for his love of corsetry? His grandmother, who he watched sip vinegar (which led to stomach muscle retraction) to squeeze into her waist-cinching undergarments. Once, he says, she almost left the house in a sheer slip, and he found the look so beautiful, it served as inspiration for future designs. And yes, he really does say he doesn’t consider his designs to be art. (Clothes, he says, should serve and be worn.) But I think, no matter what you call his creations, each one is a masterpiece, and we’re lucky to get up close and personal (no touching of course) with more than 100 of them. The lifelike mannequins make audio commentary with their projected faces. A talking replica of Gaultier himself greets viewers. 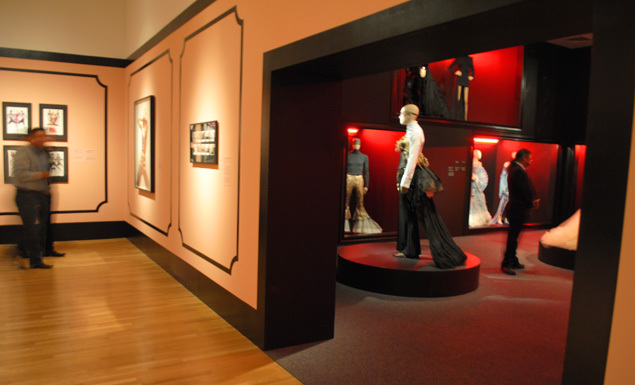 The “Punk Cancan” room includes a rotating stage of mannequins. 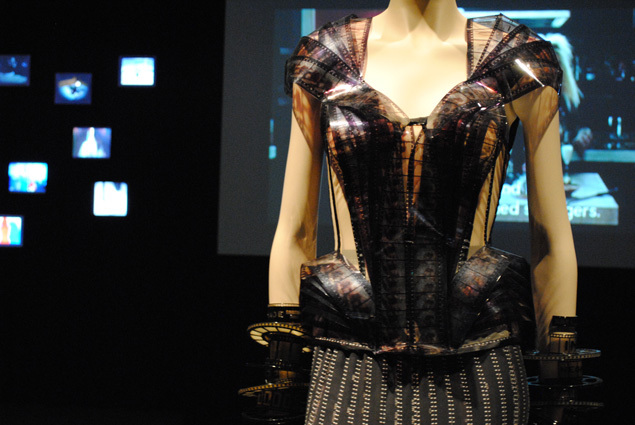 The “Urban Jungle” includes this film-made corset.